1995 was a great year for video game players worldwide. 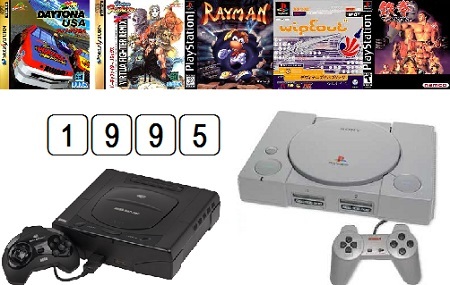 The two new 32 bit consoles entered the market and both offered a different variety of new games and game series, and the 3rd dimension as a new standard for most video games and their characters. The first real 3D (gameplay) fighting game Battle Arena Toshinden was released in January 1995 in Japan including a dozen of relative interesting new characters, many DC Comic characters were for the first time in a video game like Wonder Woman in the SNES & Mega Drive Fighting Game Justice League Task Force. Later in the year, Rayman debuted a new character who got its last big game in October 2013. At the end of 1995, Namco released a new 3D fighting game in the arcades with the name SoulEdge which meant the arrival of new characters like Siegfried and Taki, more known through the later SoulCalibur games. Iori Yagami debuted in King of Fighters’95 and became one of its most popular characters. The list below is growing every week, and will hopefully give you an overview about the game character creations from 1995!